Usually a balmy 70 degree temperature is what you would find as you roll into Fairbanks in mid-May . The trees would be green with fresh growth, flowers would be placed in pots throughout the city (even if they did come back inside at night in the rare event of frost at night). On the hills a beautiful green glow of promised spring would be evident. No so this record breaking year. This morning’s Fairbanks Daily News Miner pronounced that not since 1964 has the record cold been broken: it was 21 degrees early yesterday morning, and not much warmer today at still below freezing, 28 right now. While not unusual to see piles of dirty snow in shaded areas around town, they still remain in even larger portions in abundance. I watched as my son got into his car this morning, with his telltale frosty breath still visible at 6:40 a.m. I know summer will come. It’s just that it is taking too long. The starkness of the birch that have not yet budded is rather haunting, like a deserted and forgotten frozen north. Yes, the sun is bright and daylight began at 4:26 this morning, and won’t set until 11:10 tonight. But do you know that they are predicting SNOW on Friday, with a 50% chance of precipitation? How are we supposed to justify buying flowers in greenhouses when survival chances are against the odds with this kind of weather! I do remember snow on May 15th, followed precisely four months later with a September 15th dusting; but it didn’t stay around either time. The concern I have this year, is that if it did snow, it might just stick around a little longer…. 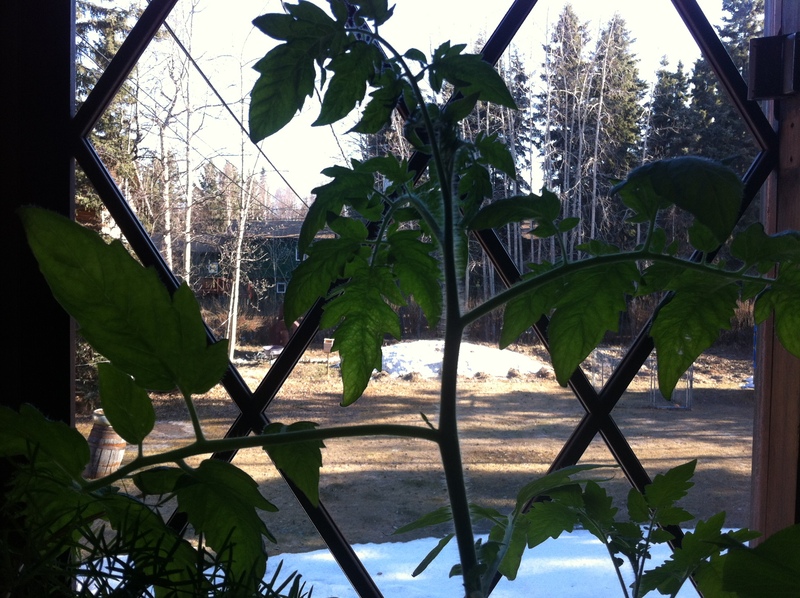 My housekeeper gifted me with beautiful tomato and zucchini plant starts that are guarded inside on my kitchen windowsills. I dare not place them in the greenhouse, where normally they belong. Even with the passive solar design, it is just too cold. My advice, as usual, is that you definitely need layers when you come to Fairbanks. Only this time, the layers you might bring should be ones that keep you warm at just above freezing. You are currently browsing the AllAboutAlaska blog archives for May, 2013.